We visited a quaint little Arts and Crafts store in Ueno, Tokyo. The moment I stepped inside, I was blinded by the many colourful items on display. From rainbow swirl pencils and blast effect markers to the colourful buckets of clay and even a musical Art Barn (activity-packed play set); I was totally immersed in the wonders of this store. My thoughts immediately turned to my crafty artist friend Emila for I'm sure she'd love to visit this lovely store too! As I made my way to the stationery corner, my eyes caught sight of something brown, small and delicious - a Choculator! My friend Nessa recently blogged about the Choculator at her place and when I saw the post, I was like Hey, I have that! 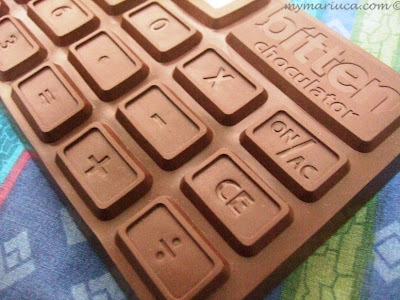 It was totally cool to see somebody else thought the chocolate calculator was interesting enough to blog about. But it was cooler to know that I just purchased one last month while vacationing in Tokyo! Perfect for chocoholics like yours truly, this fully-functional solar-powered calculator smells 100% like pure chocolate. It even feels a little like chocolate and it sure looks real enough to eat! The Choculator smells so heavenly that it's difficult to stay focus when I use it. Instead of working on my calculations, all I want to do is sniff and feel it in my hands; such is the pulling power of this delightful Choculator! The Choculator was one of my best buys from Japan. For 1050 yen, I now get to indulge in delicious-smelling chocolate, any time I get a choc attack. Even Benji is enticed by my new Choculator! :* :* :* :* Debbs still up! You and Nessa I think love chocolates too much la ... LOL! But pretty cool that Choculator. So, are you actually going to eat it? If not, send to me la ... hahaha! oh you mean it's a real calculator that smells like chocolate?? hhahahahahah how cool is that?? I thought it was chocolate shaped like a calculator.. hahhaah u sure it's not edible?? have a great sunday Marzie! Sounds yummy, GP! Since you collect perfumes kan, ada tak branded punya choc-scented perfume? Yay, always happy to chop, Marzie! You too, come chop on my MM later yeah? MM???? Wah so early dah siap MM Debbs???? Sure will chop if I don fall asleep la he he! Oh yay!! Thank you, guest for giving chance for me to get FC3!! LOL! LOL! Very true, some more the choculator smells yummy, if I were a kid sure I’d be biting on the choc too he he! Oh no! I cannot discuss yet about PB, MArzie! :) I baru start DL-ing balik after my FB craze phase. Hehe...Baru jer ttgk ep 18, but it looks like they wanted to end it cepat2 kan? Morning Benji! Had rice and Indonesian dishes for lunch. Yums! Oh okay hehe...tapi mcm lotion ada kan? Got edible, choc-scented ones right? Debbs! If u’re lucky, ul get it back within the stipulated 1 week, if ur unlucky like me and have to face STUPID INEEFICIENT ppl, then it could take up to 2 freaking months! Mana I tak angers with Screamyx dat time!!!! INEFFICIENT that is, salah spelling! LOL @ losi from adult store, ada apa choc flava gitu heheheheh! Oh dear! Bods nya diorg. They should buck up la, now that there are competitions from Maxis, Digi, W1max and whatnot. Ish!! Just in case Debbs, just in case he he! Yeah, B is now taking some pics for me for my new post later LOL! Lazing around before we go out! Hahahhahahhahahahah edible dotdotdot hahhahahah, byk tu edible dotdotdot Debbs, wonder which one ur referring to ahaks! My fren la gave me the choc losi masa hen night party hehehehehee! Hehehe I wonder how edible choc-flava losi taste like lol!!! =-O =-O =-O u've that Mariuca! I oso want! haha...it looks real enough to eat! Recent blog post: Windows, Siding, and Roofing…Oh My! That's pretty awesome. Makes me hungry just thinking about it! 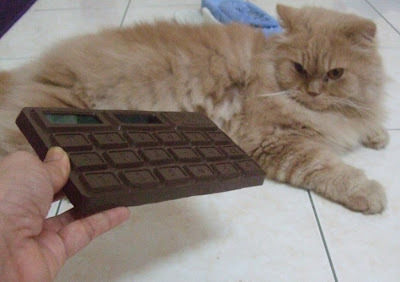 So is it a real calculator made to look like chocolates OR a real chocolate made to look like a calculator?